Some of the latest climate research results reveal troubling signs, underscoring the need to accelerate actions to stem the tide of rising greenhouse gas emissions (GHGs). Item one: On average, the oceans are heating up 40 percent faster than the U.N. International Panel on Climate Change (IPCC) stated its latest global climate change review five years ago, according to a study recently published in Science. Mean ocean temperatures have reached record highs for several years running. Item two: Antarctica’s ice sheets have been melting for the last 39 years, and the rate at which they’re losing ice has increased in each successive decade. Rising six-fold from 40 gigatons per year from 1979 to 1990 to 252 gigatons per year from 2009 to 2017, according to new research published in the Proceedings of the National Academy of Sciences. Impacts on major climate-drivers – ocean currents, global weather patterns, habitats, and biodiversity – from rising ocean temperatures, receding Antarctic glaciers, melting sea ice, and rising sea levels are numerous and varied. The ocean is changing and with it so is the abundance, diversity, and distribution of marine species. Many of the world’s UNESCO World Heritage sites suffer from these dramatic impacts, including Australia’s Great Barrier Reef, the Italian city of Venice, Yellowstone National Park and Greenland’s Sermeq Kujalleq glacier. This according to a study produced by UNESCO, the UN Environment Programme (UNEP) and the Union of Concerned Scientists (UCS). 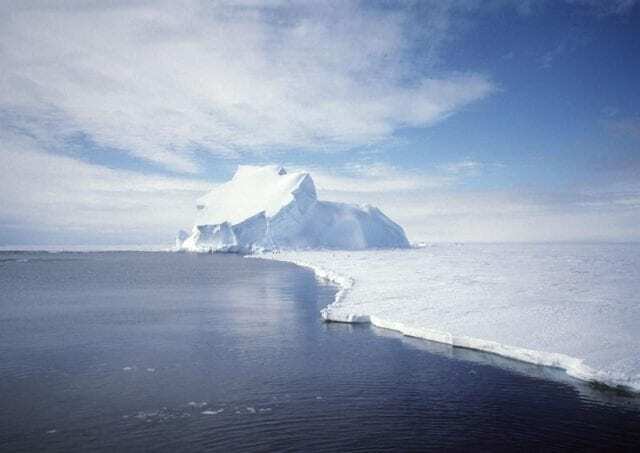 The researcher-authors of Four decades of “Antarctic Ice Sheet mass balance from 1979 to 2017,” found that the rate of ice melt across Antarctica has outpaced the accumulation of snow and ice on the continent for four decades, from 1979 to 2017. “Recent observations have shown that the ice sheet is losing mass along the periphery due the enhanced flow of its glaciers, at a rate that has been increasing over time, while there is no long-term trend change in snowfall accumulation in the interior,” according to their report. The total mass loss of ice from Antarctica increased over six-fold during the period of study, from 40 plus or minus 9 gigatons per year (Gt/y) from 1979 to 1990 to 252 plus or minus 26 Gt/y in 2009–2017. Ice loss has been greatest in West Antarctica at 48 Gt/y per decade. Notably, the researchers found significant net ice mass loss in East Antarctica over the period, however — 29 Gt/y per decade. In addition, they found there has been a net loss of ice mass on the Antarctic Peninsula of 16 Gt/y per decade. The oceans absorb about 93 percent of the excess heat resulting from rising levels of carbon dioxide and other GHGs in the Earth’s atmosphere, the authors of “How fast are the oceans warming?” highlight. Deployment of the Argo network of floating, wireless network sensors enabled the four climate scientists to obtain more and more accurate data and model changes in ocean heat content for the upper 2,000 meters of ocean waters more accurately than ever before. Observations of the ocean heat content (OHC) over recent decades reveals ocean temperatures have been rising rapidly, they report. “This warming has contributed to increases in rainfall intensity, rising sea levels, the destruction of coral reefs, declining ocean oxygen levels, and declines in ice sheets, glaciers and ice caps in polar regions,” the four researcher-authors of “How fast are the oceans warming?” highlight in Science Magazine. “The fairly steady rise in OHC shows that the planet is clearly warming. The prospects for much higher OHC, sea level, and sea-surface temperatures should be of concern given the abundant evidence of effects on storms, hurricanes, and the hydrological cycle, including extreme precipitation events,” the researchers write. “There is a clear need to continue to improve the ocean observation and analysis system to provide better estimates of OHC, because it will enable more refined regional projections of the future. In addition, the need to slow or stop the rates of climate change and prepare for the expected impacts is increasingly evident,” they conclude. There are more than 1,000 World Heritage sites in 163 countries worldwide. Many of them are important tourist destinations, UNESCO, UNEP and UCS point out. “Tourism is one of the world’s largest and fastest-growing economic sectors, responsible for 9 percent of gross domestic product globally and providing 1 in 11 jobs,” they write. Given reliance on fossil fuel-based transportation, tourism generates a lot in the way of GHG emissions — about 5 percent of total global carbon emissions — that contribute to climate warming, however, they add. That’s expected to double within the next 25 years. Furthermore, “the tourism sector itself is vulnerable to climate change. Threats include more extreme weather events, increasing insurance costs and safety concerns, water shortages, and loss and damage to assets and attractions at destinations. 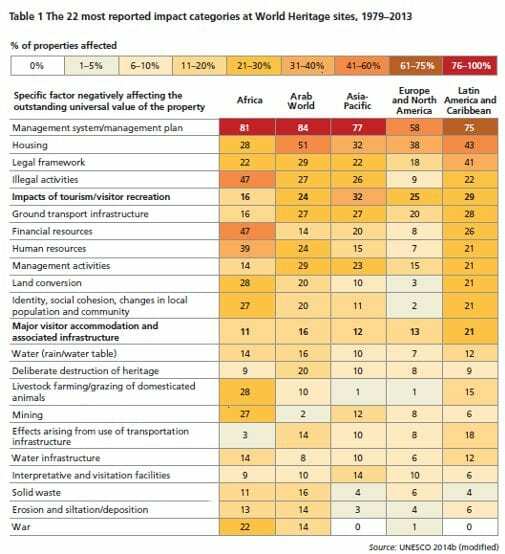 “Continued climate-driven degradation and disruption to cultural and natural heritage at World Heritage sites will negatively affect the tourism sector, reduce the attractiveness of destinations and lessen economic opportunities for local communities,” according to the report. The number of natural World Heritage sites considered “highly threatened” by climate change doubled to one in four from 2014 to 2017, according to the International Union for the Conservation of Nature (IUCN)’s global assessment of 241 sites. “Rising sea temperatures have affected coral reefs, such as the Aldabra Atoll in the Indian Ocean, the Belize Barrier Reef in the Atlantic and the Great Barrier Reef in Australia, in recent years. In 2016 and 2017, marine heat waves caused by climate change killed about half of the corals on the Great Barrier Reef, along with many others around the world. At some locations the threat is obvious and imminent,” according to the report. That includes Yellowstone National Park, where winters are growing shorter and snowfall is declining, rivers are warming, lakes and wetlands are shrinking and fire seasons lengthening. According to scientists, nearly half of the wetlands in the Greater Yellowstone Ecosystem could be lost. In addition, increasing frequency of fires is likely to lead to dense forest becoming more open woodland. The effects of climate warming are being felt on and in the water enveloping Ecuador’s Islands. El Niño events are warming waters around the Galápagos and disrupting food supplies on which many Galápagos species rely. Farther south and east, rising sea levels and higher waves during storms threaten to topple the moai statues on Chile’s Rapa Nui, or Easter Island. “The need to act is both urgent and clear. We must reduce greenhouse gas emissions in line with the Paris Agreement while providing the financial resources, support and expertise necessary to ensure the resilience of World Heritage properties over the long term. A growing body of knowledge, management guidelines and policy tools already exists that can help us achieve these goals. “Success will require us to expand our networks and partnerships with local communities and businesses and to encourage the tourism industry to join us in this vital task,” Ligia Noronha, UNEP Director, Division of Industry, Technology and Economics, Mechtild Rössler, UNESCO Director, Division for Heritage and World Heritage Centre, and UCS President Ken Kimmell stated.